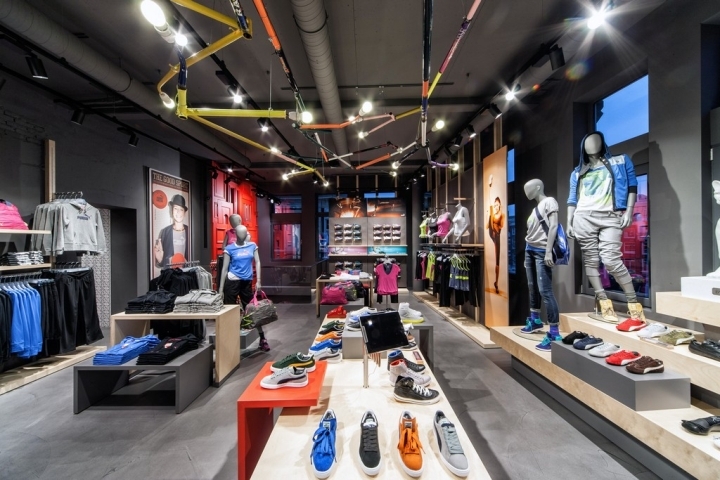 Plajer & franz studio under the direction of a Les Kernjak (head of global store concepts, puma retail ag) gave the puma store in downtown Amsterdam a thorough makeover . 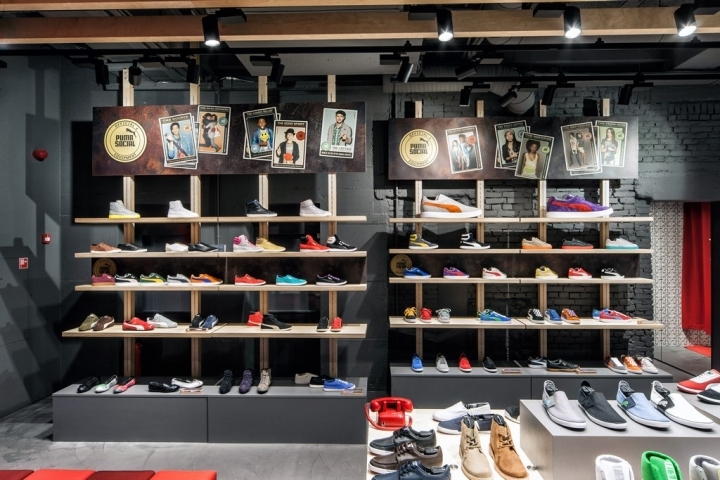 A 305 sqm space spread over three floors is injected with a dose of joy, innovation, simplicity and various local influences, while being accomplished according to puma’s sustainable guidelines. 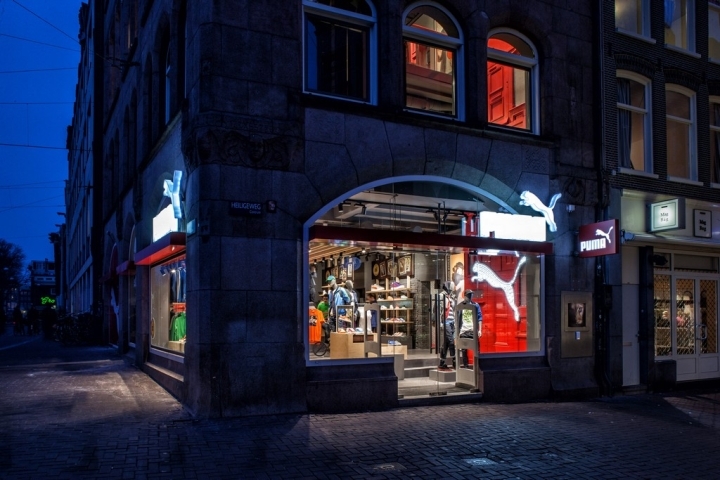 Footwear, still puma’s core competence, plays the leading part in the new store concept and has been given the most prominent status with a footwear tribune on each floor and a special footwear showcase. 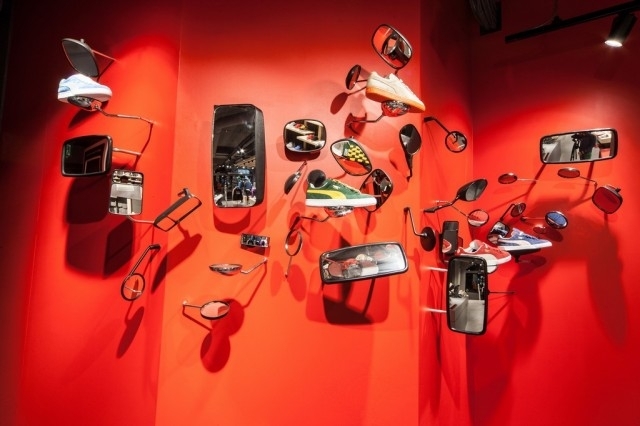 Moreover, it presents itself proudly on the mirror wall, one of the local elements in the store, where vintage car mirrors serve as their display platform. 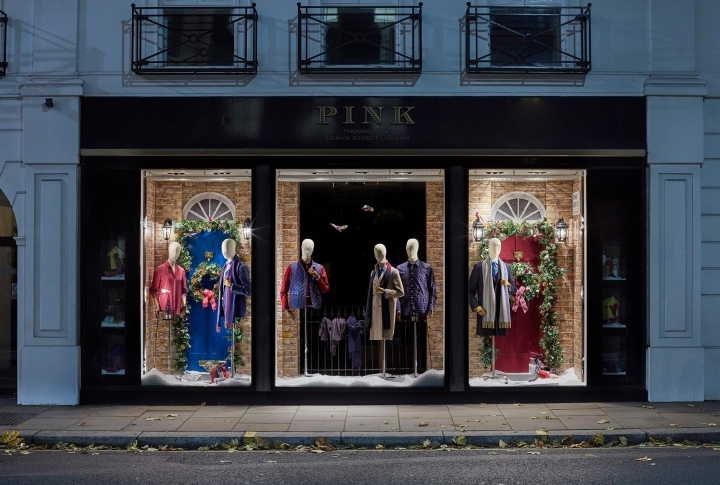 The installation has been created by ‘the invisible party ’, a local artists collective, who used the dutch tradition to place car mirrors on the doors and windows of houses to allow seeing who rings the door bell before answering it. 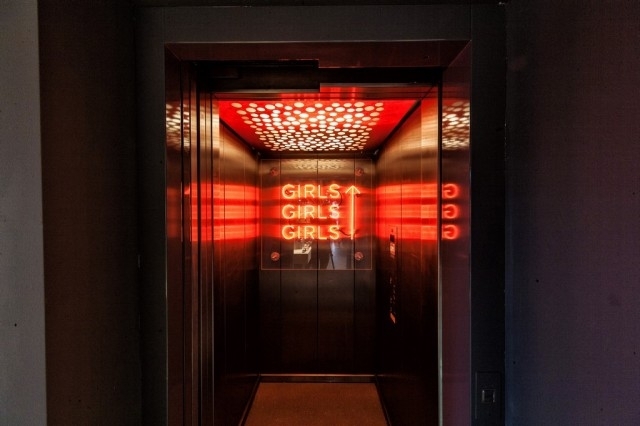 Further enhancing the local relevance of the store is a l ighting system on the second floor made out of old bike frames welded together as well as a bike wheel installation in the staircase void. The changing rooms are covered in traditional delft tiles, which have been ‘pumarized’ accordingly. 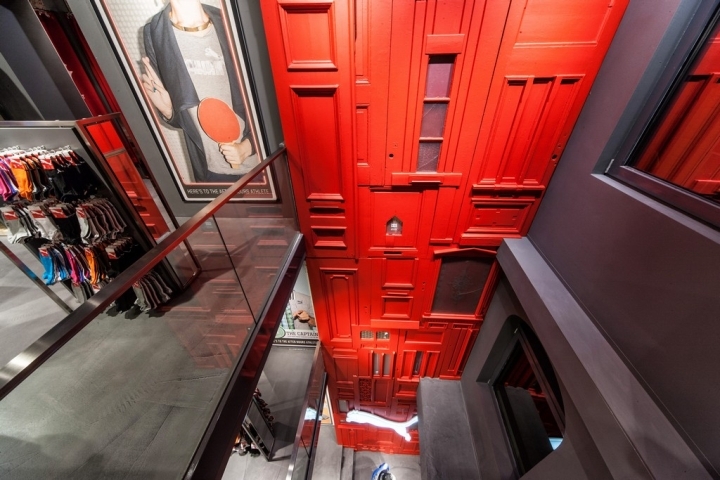 The most eye-catching local element however, is the huge brand wall stretching over all three f loors and constructed from a collection of old amsterdam-doors that have been painted red and recharged with a huge puma logo. Other joyful props and gadgets adding the fun factor to the store can be found all over the place – sometimes pretty obvious like the lif e – size puma cat sculptures greeting visitors at the entrance, or the puma un-smartphone ringing when approached, sometimes more discreet in form of witty signs or little, hidden details. 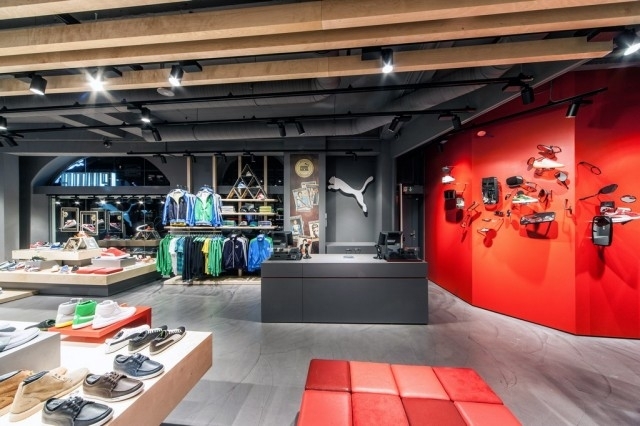 The idea behind these is to give the customers the experience of fun while shopping at puma, which is further facilitated by elements allowing them to interact . 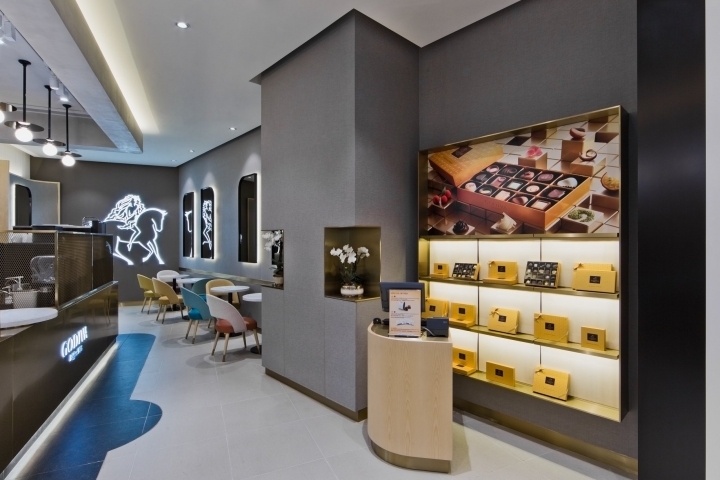 Herefore, ipads have been installed to display tables giving shoppers to opportunity to browse through and purchase items from the european online store, which offers a wider merchandise assortment, complete size runs and alternative colors of items stocked in store. 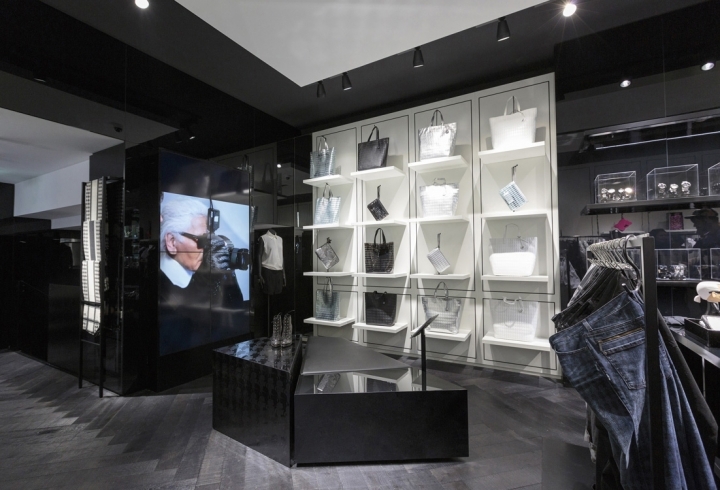 These technological inputs further aim at unifying both worlds – online shopping and the experience of a ‘real’ store. 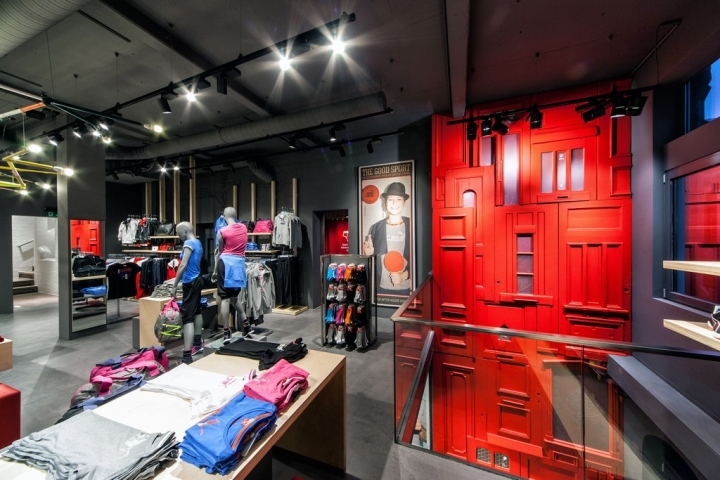 Despite numerous entertaining elements, the store design conforms to puma’s sustainable guidelines. 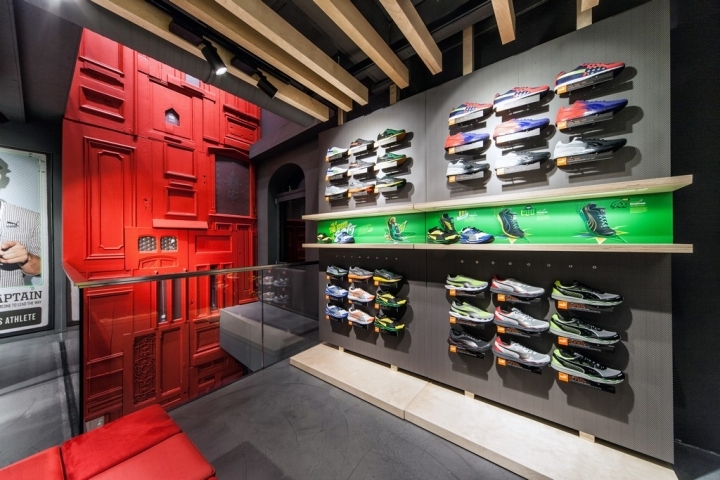 The general use of materials in the store has been reduced to the minimum, leaving the ceiling open and the brick walls untreated. 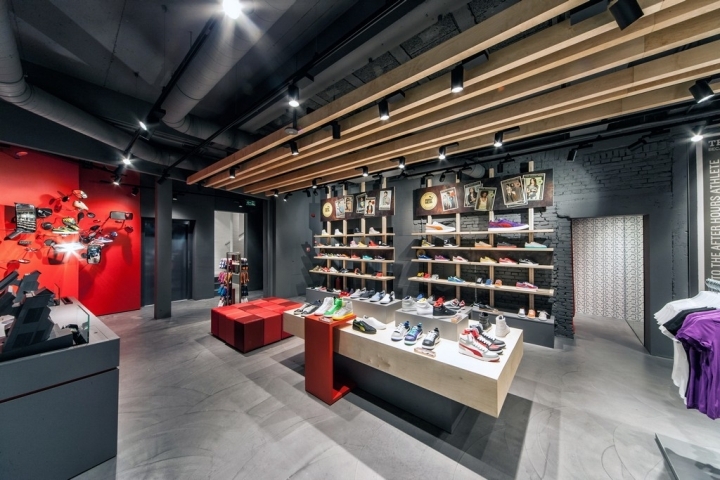 Any materials used such as wood for the ceiling beams, the furniture or floor finishes are FSC certified. 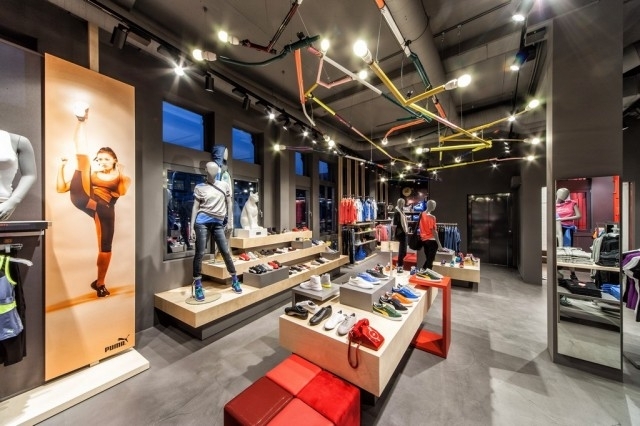 Above that, an efficient lighting system, using mainly HIT-lights, has been applied to save the energy consumption of the store and thus reducing its ecological footprint .